Celebrating over 44 years, the ‘Reggae Ambassadors’, THIRD WORLD is one of the longest lived Reggae bands of all time, and one of Jamaica’s most consistently popular crossover acts among international audiences. Mixing in elements of R&B, funk, pop, and rock and, later on, dancehall and rap, Third World’s style has been described as “reggae-fusion”. Singer Bunny Rugs described the band’s sound: “Strictly a reggae band, no. Definitely a reggae band, yes.” Guitarist Cat Coore said of their music: “The hybrid of various types of music is a natural thing because, by growing up in Jamaica, we know the direct roots of reggae and ska. At the same time we live in a country where you get to hear Chuck Berry, Fats Domino and all the R & B artists.” Bassist Richard Daley said, “We took roots reggae music and put branches on top of it”. 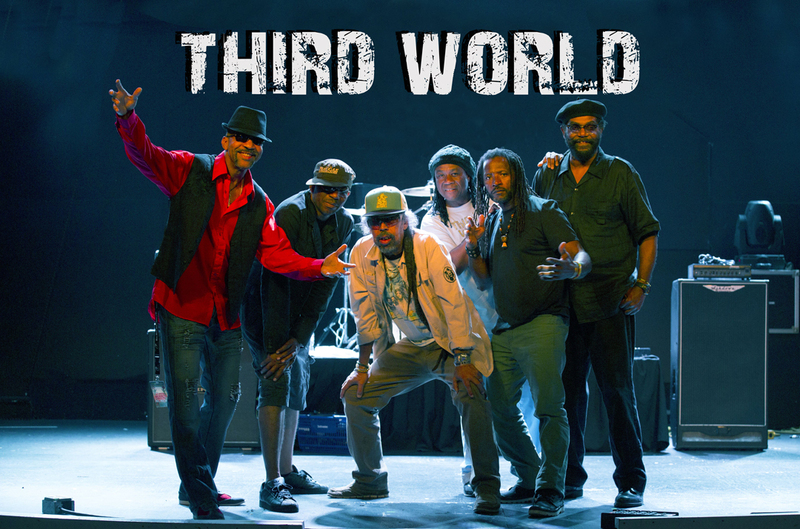 The genesis of Third World was originally formed in 1973 by guitarist/cellist Stephen “Cat” Coore, keyboardist Michael “Ibo” Cooper, drummer Carl Barovier and singer Milton “Prilly” Hamilton all of Inner Circle, along with bassist Colin “Oliver” Leslie. Tomorrows Children bass guitarist, Richard Daley soon replaced Colin Leslie and Leslie teamed up with Darren Green to manage and organize the group. After a few months, Barovier was replaced by Cornell Marshall, and the group made its live debut that year at Jamaica’s Independence celebration. They played in and around the Kingston club scene and on the hotel scene island wide, making a name for themselves as one of the few fully self-contained bands around. In 1974, percussionist Irwin “Carrot” Jarrett joined the group and that same year they recorded their debut single, “Railroad Track”. In 1975, Third World was eager to broaden their musical horizons and took a chance by travelling with no tour dates on the books to England. The trip was fortunate and Third World subsequently inked a deal with the internationally minded Island label, who sent the young talented musicians out as the opening act for Bob Marley & the Wailers’ 1975 World Tour. Their self-titled debut album, Third World was released on the Island imprint in 1976 and featured a popular cover of the Abyssinians’ the roots classic “Satta Massagana.” The follow-up, 1977’s “96° in the Shade”, introduced new drummer Willie “Roots” Stewart and new lead singer William Clark, aka Bunny Rugs. The LP was an enormous critical success in the U.K. and Europe, and spawned an all-time classic single in the title track. That set the stage for the group’s commercial breakthrough album, 1978’s Journey to Addis, which featured a funky, disco-flavored reggae cover of the O’Jays’ “Now That We’ve Found Love.” The song hit the Top Ten on the American R&B charts in 1979, as well as the British pop Top Ten, and the LP climbed into the R&B Top 20. The follow-up single, “Cool Meditation,” made the British Top 20 and Third World emerged as international stars. The group quickly followed its breakout hit with The Story’s Been Told later in 1979, and it charted in the US. In 1980, they issued two albums, Arise In Harmony and the film soundtrack Prisoner in the Street, which marked the end of their tenure with Island. Third World next signed with CBS and debuted with 1981’s Rock the World, which gave them another significant crossover hit in “Dancing on the Floor (Hooked on Love),” a British Top Ten. At the 1981 Reggae Sunsplash Festival, Stevie Wonder joined Third World on-stage to perform his tribute to Bob Marley, “Master Blaster (Jammin’)”; it went well enough that Wonder wrote and produced two singles on the group’s next album, 1982’s You’ve Got the Power. The first single, “Try Jah Love,” was a funky dance track that became another significant crossover hit in America, nearly hitting the R&B Top 20. The second single, “You’re Playing Us Too Close,” wasn’t as commercial, but the musical synergy created in the recording studio between Wonder & the band was so dynamic that You’ve Got the Power became Third World’s second album to hit the US R&B Top 20 charts. The band’s success continued on through the ’80s, as 1983’s All The Way Strong and 1985’s Sense of Purpose both made the R&B Top 50. The latter album produced several crossover hits in the title track, “One To One,” and “One More Time,” which sported state-of-the-art, club-friendly dance beats. In 1987 Third World collaborated in the studio with songwriters, Gamble and Huff and CBS released, Hold on to Love, the album went on to be their first of 10 Reggae Grammy nominations. After their departure from CBS, the band joined the Mercury label and their 1989 label debut, Serious Business, restored their commercial standing with American R&B audiences, climbing into the Top 30 on the strength of a third major crossover hit, “Forbidden Love.” One of the first commercially successful fusions of reggae and rap, “Forbidden Love” featured a guest appearance by Stetsasonic lead rapper Daddy O, and charted in the R&B Top 20. Third World’s second Mercury album was 1992’s dancehall-flavored Committed, which produced a Top 30 R&B hit in the title cut. Their next release, 1994’s Live It Up, appeared on the band’s own label, TWB. In 1997, founding member Michael “Ibo” Cooper and Willie Stewart both departed, and were replaced by keyboardist Leroy “Baarbe” Romans and drummer Tony “Ruption” Williams, respectively and the return of Rupert Bent. This lineup released Generation Coming in 1999, landing guest spots from Shaggy and Bounty Killer. Afterwards, Romans was replaced by Herbie Harris, who made his studio debut on 2003’s Ain’t Givin’ Up. The same year Third World celebrated a quarter century of playing music by re-recording their classics for 25th Anniversary. Two years later they returned with Black, Gold, Green which included guests Beres Hammond, Wayne Marshall, and Blue Fox. Their 2011 effort, Patriots, was released under their own label imprint, Third World Music Group featuring collaborations with Toots Hibbert, Marcia Griffiths, the late Gregory Isaacs, Sly Dunbar, Robbie Shakespeare, Dean Fraser, Inner Circle, Mykal Rose, Junior Reid, Capleton, Stephen & Damian Marley, Tarrus Riley and Tessanne Chin. Single releases from Patriots include the “Spirit Lives ft Junior Reid & Inner Circle”, “By My Side ft Season 5 The Voice winner, Tessanne Chin” and showcased in Robert Townsend’s popular online series “Diary of a Single Mom”, “Good Hearted People ft Capleton”, and a remake of the band’s classic, “96 Degrees In the Shade ft Stephen and Damian Marley”. In February 2014, lead singer William “Bunny Rugs” Clarke lost his battle with cancer. Noted and influential members of the music industry recognized Rugs for his contribution to the globalization of Reggae Music. At the time of his death, the group completed a new studio album, “Under The Magic Sun” with Cleopatra Records, which is livicated to Mr Reggae Ambassador, Bunny Rugs. The album features covers of pop/rock classic in the signature Third World 4 part harmony and reggae groove and features the smooth vocals of one of Third World’s new band members, AJ Brown. In 2017, Third World released a new record, Eyes Are Up On You, produced by Damian “Junior Gong” Marley. Marley is producing the lasted album project for Third World with a projected 2018 release. Biography sourced from the band’s official marketing information.